In Global Warfare on Facebook, you have several defenses at your disposal to help protect your base. First off, you need to build a perimeter. The perimeter is located on the edge of your city just click it to begin building the structure. Level the perimeter to gain more defenses for your city. You can build mines, stinger missiles, artillery, and anti-aircraft gun emplacements inside your perimeter. These structures provide additional defenses fro your base and you should build as many of these as you can to protect your base from your enemies. After you have basic mines, you can start to develop more of your base defenses. You’ll need to conduct research to develop them all. Stinger Missiles – Level 8 player, level 4 perimeter, level 4 factory, level 2 military science, level 2 optics. Artillery – Level 9 player, level 6 perimeter, level 6 factory, level 5 optics. Anti-Aircraft Guns – Level 10 player, level 8 perimeter, level 8 factory, level 7 optics, Level 7 combined arms. 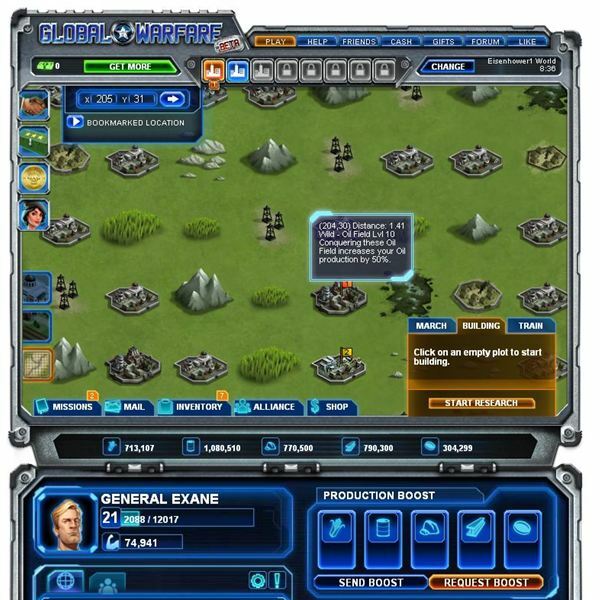 Build a barracks and rally point to begin making troops and use the rally point to send them on missions. You’ll require different structures and technology to build all the troop types in the game. Basic infantry and supply trucks will get you started but you’ll need units that are more powerful. 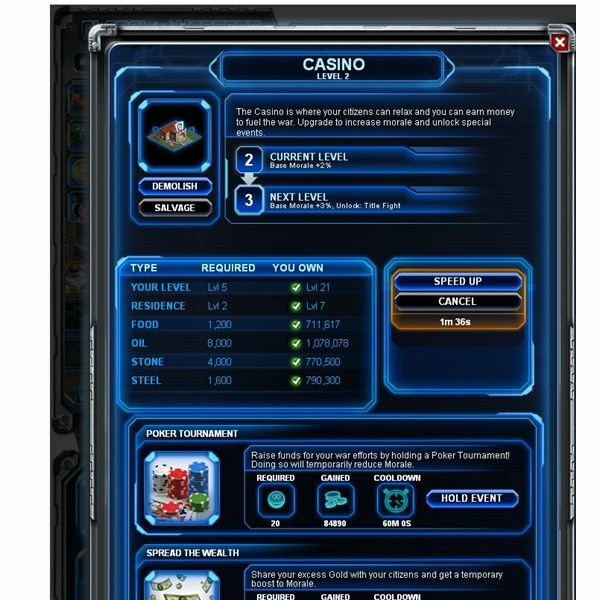 Here are the other units you can build and the requirements for each of them. Sniper Units – These are strong against other infantry units but weak against other units such as tanks. Build a level two barracks, and research level 1 optics to build your first sniper unit. Anti-Tank Units – use these specialized infantry against tanks or mobile Sam units. They are weak against other infantry in the game. Build a Level 3 barracks, level 2 factory, and level 1 military science to get your first anti-tank unit. Tanks – These units make up the bulk of your ground forces and are heavily armored. Build a level 6 barracks, level 5 factory, level 7 tank depot, and level 5 satellite navigation to gain access to your first tank unit. Supply Helicopter – this unit carries more resources than supply trucks and can help to fuel your war efforts. Build a level 5 barracks, level 1 tank depot, level 3 air traffic control, level 1 operations research, and level 3 combined arms to build your first supply helicopter. Mobile SAMS – Mobile SAMs are specialized mechanized units. They are strong against air units, but less effective against infantry and tanks. 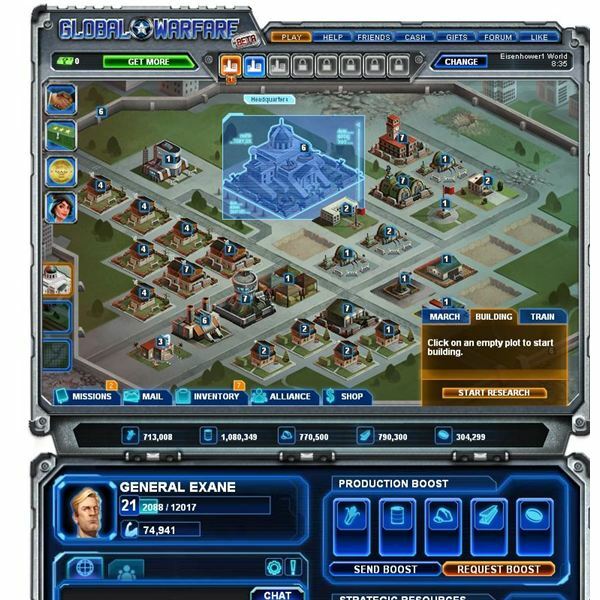 Build a level 4 barracks, level 1 tank depot, and level 1 satellite navigation to build your first SAM unit. Gunships – Gunships are good air units that are effective against all units except fighters. Build level 8 barracks, level 6 factory, level 3 tank depot, level 7 air traffic control, level 7 materials science, and level 7 combined arms to gain access to your first gunship unit. Fighters – Fighters are great air units that specialize in killing bombers and gunships but have problems with ground units level 7 barracks, level 5 factory, level 5 air traffic control, level 5 combined arms, level 6 optics to gain access to your first fighter unit. Bombers – Bombers are heavily armored air units that inflict high damage. They are effective against all units except fighters. Build a level 9 barracks, level 9 factory, level 9 air traffic control, level 9 combined arms, and level 9 optics to build bombers. Hellfire Tank – Hellfire Tanks are great mechanized units but require Titanium to train. They inflict high damage and are more resistant to anti-tank fire. Build a level 10 barracks, level 10 factory, level 9 air traffic control, level 9 combined arms, and level 9 optics, to build your first hellfire tank. Stealth Bombers – Stealth Bombers are great air units that require Graphene to train. They inflict high damage and are more resistant to other air units. Build a level 10 barracks, level 10 factory, level 9 air traffic control, level 9 combined arms, and level 9 optics, to build your first stealth bomber. Be sure you have plenty of food reserves once you start building the more advanced units in the game. Upgrade your farms and research agriculture to improve your food output. Consider turning one of your additional cities into a food farm so you always have additonal supplies of food for your growing armies. Enjoy Global Warfare on Facebook and be sure to join an alliance to learn all you can about the game. There is an in-game chat system as well so use that to your advantage. All images from Global Warfare. Source: Article is author's own experiences playing Global Warfare on Facebook.